Rent a Rib In Santorini and spend your day on a private Cruise exploring the secluded beaches of Santorini. Cruise inside the caldera, Visit the volcano and the hot springs, Have lunch at Thirassia and snorkel into the crystal clear waters of Akrotiri! Enjoy a unique private Full Day RIB cruise, visiting nearby islands of your choice, such as Thirassia with its crystal blue waters, Ios beautiful beaches and peaceful bays, exciting party and cosmopolitan Mykonos, or Folegandros with its relaxing Aegean atmosphere. Experiencethe most incredible sea spots of the Cycladic islands cruising on your Santorini RIB rental. Cruise Santorini’s deep blue waters, enjoying the unique sunshine and warmth of the Caldera, you can experience a different way to enjoy the beauty of the island, the sun and the sea-breeze aboard. You have a unique chance to discover the real sea treasure of Santorini island. Start at the port nearest to your Hotel and visit the sights worth seeing while on your Santorini holiday! Stop at the Red beach for pictures and discover the only white beach in Santorini on your RIB! Swim at the crystal clear waters of Akrotiri and cruise inside the Caldera where you’ll Discover the magnificent Hot springs of the Volcano and get a dose of the anti-aging minerals it has to offer! Upon request the rib cruise can start at a different time and can be longer. Why Choose a Santorini Boat Water Taxi. You can be anywhere any time! By taking a water taxi service you can travel from island to island without stressing about tickets, timetables and overcrowded ferry boats. Cable Car and donkey pathway. After steping off the cruise ship into the old port of Fira where it docks. You have 2 choices. Either take the cable car might take you up to two hours of your precious time in Santorini or the Donkey Path which is a 1000 step uphill walk. You can skip all that torture by taking the Water Taxi of Santorini to Oia port named Ammoudi which from there you can take a local taxi and in 5 minutes be in the main town. Reasonable Rates and Excellent Service. You will receive a reply ragarding your Santorini Water Taxi within 24hours. 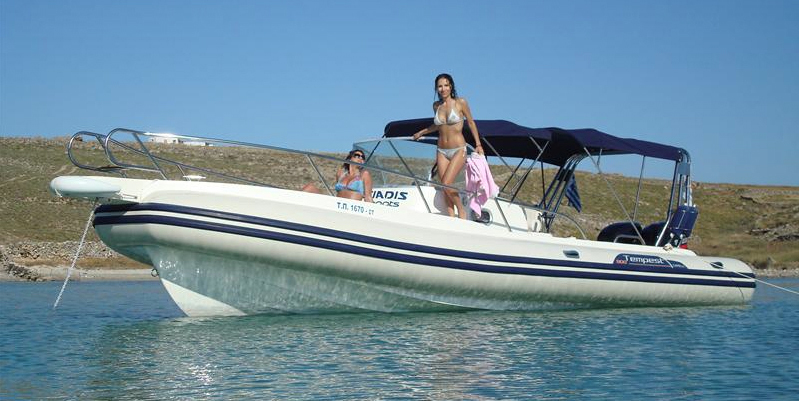 Santorini Boat Rates are reasonable to suit every kind of tourist. Be at your destination Fast and at low cost. In case the water taxi service is Island hopping. We will pick you up from your hotel, airport or port and take you to the location where our boat is docked. Prices for Private Transfers upon special arrangement. Enjoy a unique private Full Day schedule, visiting to nearby islands of your choice, such as Anafi with its crystal blue waters, Ios reaching beautiful beaches and peaceful bays, exciting and cosmopolitan Mykonos, or Folegandros with its relaxing atmosphere. Experience the most incredible sea spots of the islands. Caldera Private Rib Cruises along Santorini’s deep blue waters, enjoying the unique rime of the Caldera, you can experience a different way to enjoy the beauty of the island, the sun and the sea-breeze aboard. You have a unique chance to discover the real sea treasure of the island. Our cruise package includes: • Transportation from the hotel with air conditioned buses • Snorkeling gear • Maps and information about our island • Towels If the request is a fast and safe private transfer to Caldera or to another island, you have the best choice. The Rib Boat’s high quality and specifications ensure the ultimate comfort to the transition. We provide full transportation service from/to the hotel to/from the port our boat will be docked at with a/c luxury mini buses.